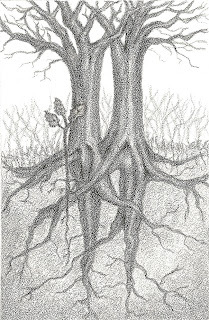 This is a drawing about grafted families. It was done with graphite on coquille paper. As we abuse the world we live in we don't think that it effects us. I look at these two trees I can see the intertwining of bodies and the life that they created together next to them the sapling their child that was created by cross pollination. Nature has relationships just as we do and as we destroy it we are participating in genocide of not only nature but ourselves too. So beautiful drawn and then deep. Oh, this is great! I adore trees! They are rich with stories and traditions, I love that you worked them into the theme of this week! Bravo!